The recommended dosage is one drop in the affected eye(s) once daily in the evening. The dosage of LUMIGAN™ should not exceed once daily since it has been shown that more frequent administration may decrease the intraocular pressure lowering effect. LUMIGAN™may be used concomitantly with other topical ophthalmic drug products to lower intraocular pressure. If more than one topical ophthalmic drug is being used, the drugs should be administered at least 5 minutes apart. Bimatoprost 0.3 mg with benzalkonium chloride 0.05 mg; sodium chloride; sodium phosphate, dibasic; citric acid; and purified water. LUMIGAN™ is indicated to reduction of elevated intraocular pressure in patients with open-angle glaucoma or ocular hypertension who are intolerant of other intraocular pressure lowering medications or insufficiently responsive (failed to achieve target IOP determined after multiple measurements over time) to another intraocular pressure lowering medication. 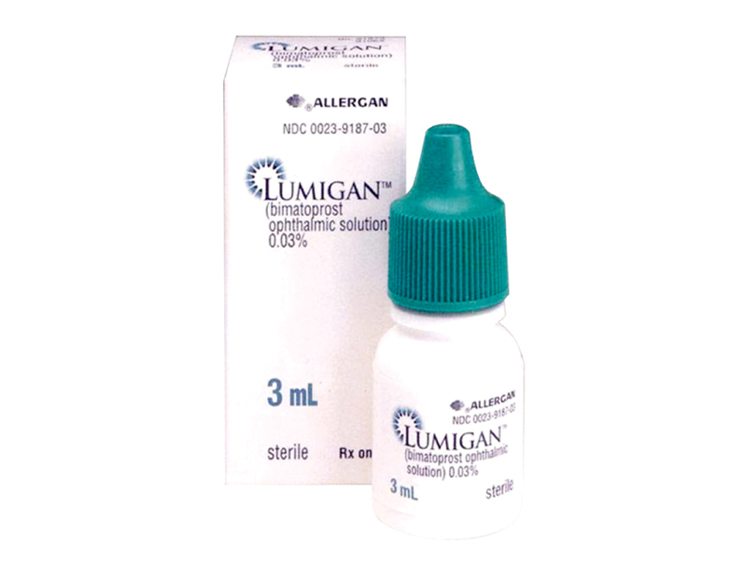 LUMIGAN™ ophthalmic solution is supplied sterile in opaque white plastic dropper bottles in 3 mL size.